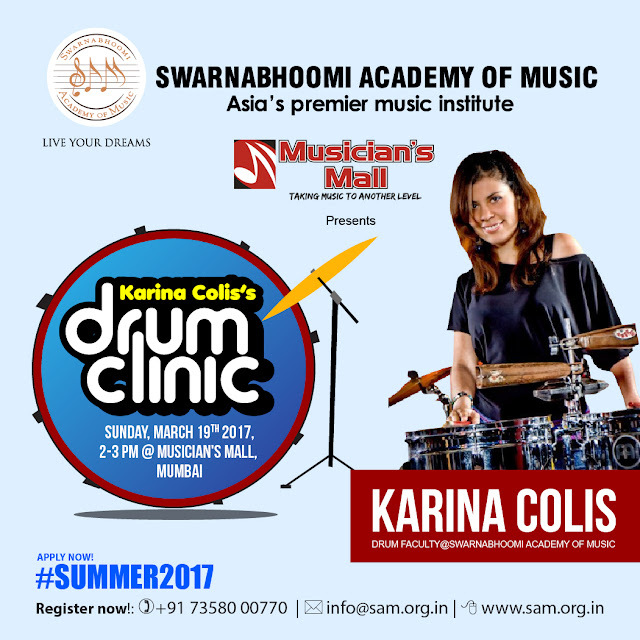 Mumbai, 14th March 2017: Swarnabhoomi Academy of Music, Asia’s Premier Institute for Music in association with Musician’s Mall, brings to Mumbai internationally renowned drummer Ms. Karina Colis for a “Drum Clinic” on 19th March 2017. The one hour workshop will concentrate on offering drummers an opportunity to learn some of the finest techniques to broaden their scope of musicianship and drumming abilities. The workshop will also see Ms. Karina Colis educating the participants about various music styles from latin to fusion. · The institutions are located at Swarnabhoomi, off the scenic ECR near Kalpakkam, Chennai. Karina Colis, drummer, percussionist and vocalist from San Luis Potosi, Mexico based in New York city, is a touring artist having performed extensively in Mexico, the US, South America, Europe, Asia, and the middle East with several projects that rank from Latin, jazz, world and fusion having appeared in more than one hundred radio stations, TV programs Worldwide. Some of their highlight performances include international festivals and venues such as International Circuit in Bahrain, the Middle East, (Calpulli Danza Mexicana) Montreal Jazz Festival in Canada, ‘Vive Latiino” the biggest festival in Latino America in Mexico City “Fusion Festival” in Germany, “International folk Festival” in Argentina,“Virada Cultural” in Brazil, (an open air festival with a an audience of 300,000 people) New Morning in Paris and Babel Fest in France as well as other performances in more than fifteen countries with Chicha Libre. In New York Karina has performed with many renown musicians at venues such as Birdland jazz club, (Alon Yavnai CD release Party) The Zinc Bar, Fat Cat, Eunconter of Colombian MusiciaNS in NY (Gregorio Uribe Big Band), Lincoln Center (Pablo Mayor) Joes Pub (Chicha Libre), Brooklyn Festival and the Latin Culture week at Berklee (Jarana Beat) Linclon Center (Pablo Mayor Quartet) Drom (Gabriel Guerrero trio) Smalls jazz club (saxophonist Sharell Casity) Bar 55 (award winner bass player, John Benitez), Iridium jazz club among many more.